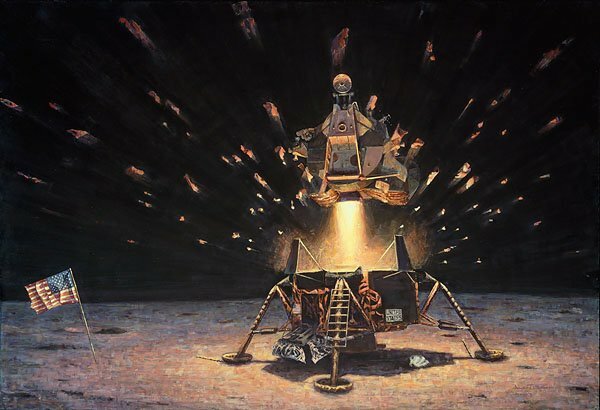 Lunar Module Eagle has just made the first lunar liftoff. Neil Armstrong and Buzz Aldrin are ascending from Tranquility Base to transfer themselves and their treasure of moon rocks to the command module and head for home. "On the Apollo 12 mission, I recall looking out the window during lift-off and seeing a ring of bright orange, silver and black flashes of light expanding rapidly outward, glints from pieces of metal-foil insulation blasted from the descent stage by the ascent engine."